Hungarian Vizsla Forums > General Vizslas > Diet & Eating > Too Skinny? 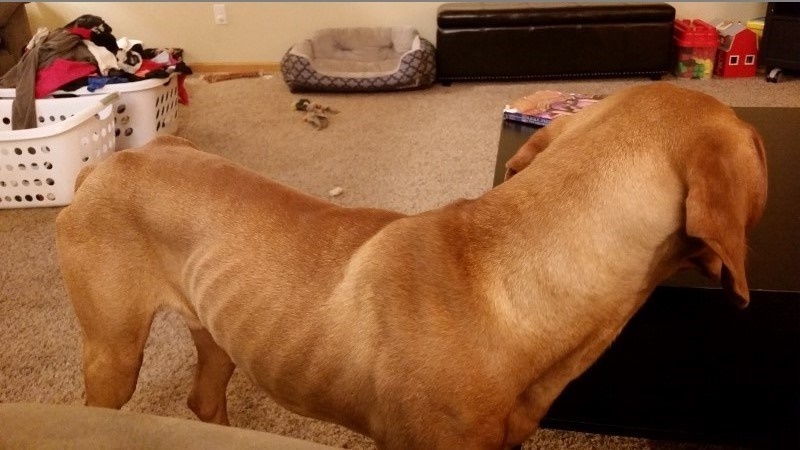 We noticed our dog had lost some weight when we got him back from hunt training and we were okay with that, but he seems to be continuing to lose weight. Is he too skinny? I have not seen a lot of vizslas in person, and it is hard to tell from the internet. We are currently feeding about 3 cups a day of Eukanuba Large breed puppy (this is what the breeder fed him, and we have not switched it yet) We have decided to up it to 4 cups a day. Splitting it up into 2 cups per feeding. Do we need a diet change, or just more of what we are giving him? 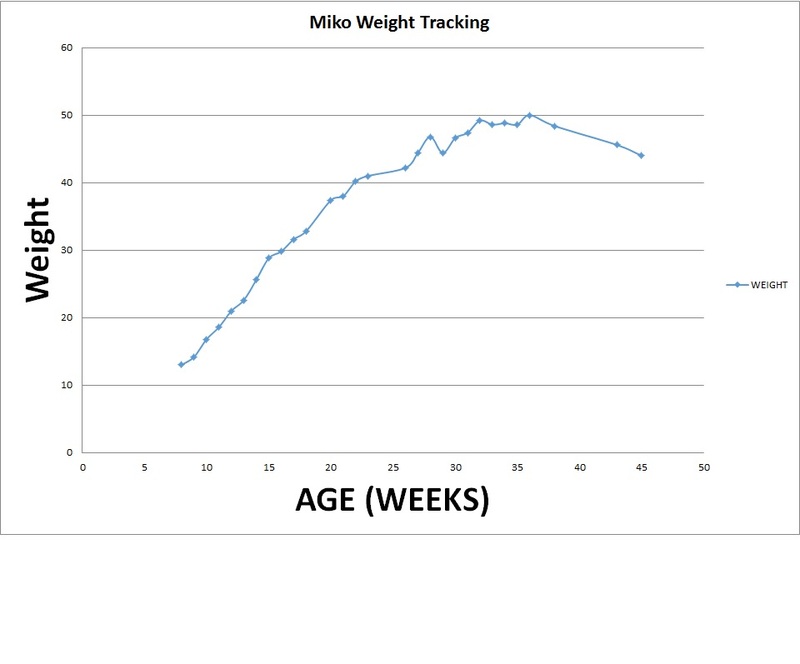 I attached a weight chart, and a picture of him for reference. It's not uncommon for them to lose some weight, when away at training. It's the adjustment to being kenneled, and working in the field. He is slightly underweight, if your not running him miles everyday. I would up the food a little bit, and have him checked for worms. Bob Engelhardt, WillowyndRanch and trevor1000 like this. In all honesty, he probably does run miles each day. He gets at least 2 hours of off leash time while we are doing chores, or playing with the kids outside. It isn't uncommon for him to get 5 hours off leash time a few times a week. He spends the entire time chasing whatever unfortunate bird happens to land within a 150 yard radius. I have noticed the last couple of days he is panting heavily and takes a while to recover after a long hard run. It is also getting warmer, so that might have something to do with it. Trevor, he is 11 months old now. Either way, better safe than sorry. I will make a vet visit znc increase his intake. I'll try to fatten him up with some extra treats like the satin balls. I'll update in a few weeks when I have some time to see any results. They go through periods of being thin when younger. He might just need a few extra calories, with all the running he gets. I'd rather see one a little thin than overweight. You will all probably think this is funny. June has always been my less active vizsla. Even when the other dogs are still running, she will come walk next to me after a little while. But spoiled girl has a big appetite, and thinks of treats constantly. Anytime I've tried cutting back on her food, she's became a counter surfer. So now I feed her a food named Fat Dog. Higher in fiber, and lower in calories. She gets to eat more, and weigh less. So everyone is happy. pippylongstocking and MikoMN like this. I'm going to look into this for my beagle. Poor thing doesn't understand that she is only a 20lb dog. Maybe it will help her stop trying to get into everything constantly. I haven't weighed her, but can tell she's lost some weight. I even had to tighten her collar a notch. The worst thing one can do is feed a Vizsla a low-calorie diet. Canines (Vizslas especially) thrive when the burn fat as their primary energy source. Far better to feed a high-protein/high-fat diet (which will raise stamina) that to feed a diet high in carbohydrates (which rob dogs of stamina and endurance). The Total cereal and molasses (sugar) in "Satin Balls" are really poor ingredients to feed to dogs. I'm sure the 1/4 cup of unsulfured molasses spread out over a few weeks won't be too bad for them.